Congress in-charge of communications department Randeep Surjewala alleged that some state BJP leaders were threatening TV channels with cases in the name of the Election Commission. NEW DELHI: The Congress today alleged that Gujarat Chief Minister Vijay Rupani and Union Minister Piyush Goyal threatened journalists in the name of poll code for airing Rahul Gandhi's interviews, and requested the Election Commission for registration of cases against them. "We strongly condemn the BJP and its leaders for their arrogant behaviour, for their unconstitutional attitude. We warn the BJP that they cannot impose such restrictions on the media as there is still rule of democracy in the country. "We urge the Election Commission to take note of these threats and initiate action against BJP leaders," he told reporters. Alleging that the BJP leaders were now acting as "chief electoral officers", he said that the party demand the the EC register cases against them for "conspiring to tarnish the poll body's name". Asked who were issuing such threats to journalists, he said, "We are on record to say that the Gujarat chief minister and the Gujarat BJP chief are calling up TV channels and have threatened them. Union minister Piyush Goyal has also said that cases will be registered against those airing Gandhi's interview." 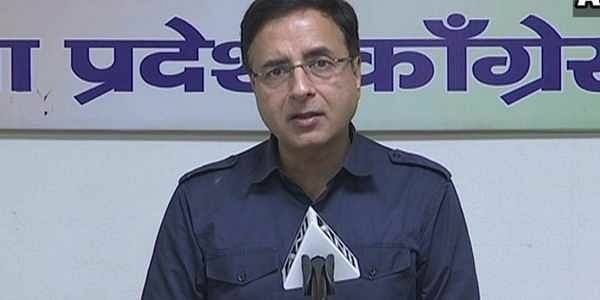 Surjewala said it was for the Election Commission to decide whether someone has violated the model code of conduct or not and BJP leaders cannot threaten anyone over it. He also said that during the 2014 Lok Sabha elections, Prime Minister Narendra Modi gave an interview to a channel a day prior to voting. "If that was not violation of Model Code of Conduct, how could Rahul Gandhi's interview be?" he asked. The Congress leader also referred to the BJP releasing its manifesto a day ahead of the first phase of polling in Gujarat on December 9. Some local news channels in Gujarat telecast Rahul Gandhi's interview ahead of the second phase polling in the state on December 14. The BJP complained to the EC about the airing of the interview after which Gujarat's Chief Electoral Officer B B Swain said a report will be submitted to the Election Commission of India. While the BJP claimed that airing of interviews was a "clear violation" of the poll code, Swain said the rules and guidelines prohibit campaigning in the 48-hour period before the end of polling do not amount to a "gag order". But we cannot call it a gag order," Swain told reporters. "Yes, we have received a complaint. We will acquire the CD of interview(s) and watch it to decide whether it has violated various provisions of section 126 of the Representation of the People Act. After that we will convey our opinion to the Election Commission," he said. Section 126 is about 'prohibition of public meetings during period of forty-eight hours' prior to end of polling. When asked if a restraining order has been issued to news channels to stop the broadcast, Swain only said that he would first examine the evidence. "Before the start of 48-hour period, all the rules related to campaigning as prescribed under section 126 were brought to the attention of political parties and candidates. Now if a complaint comes about an interview, we will first examine the evidence," said Swain. As per the EC guideline for the media, electronic media, including TV channels, can't broadcast anything related to the elections after 5.00 pm of December 12.